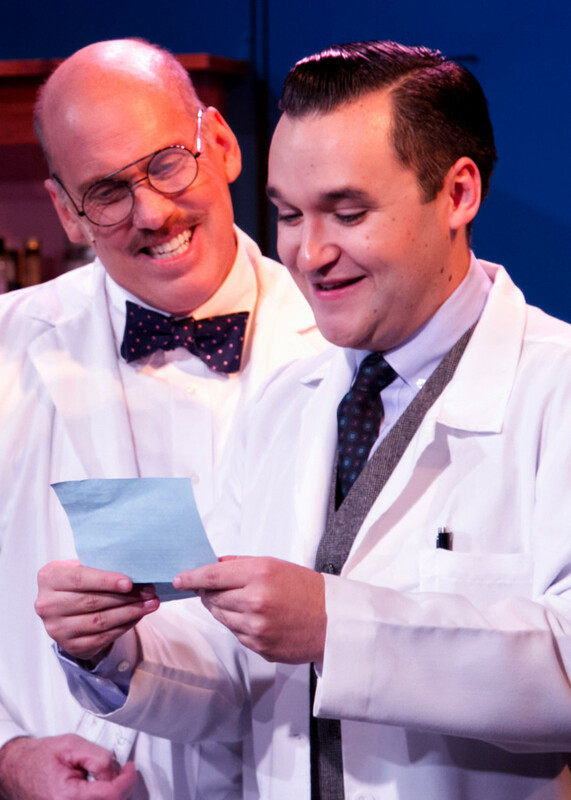 Dear Friend: There’s Plenty To Love About “The Chance Theater’s” Restaging Of “She Loves Me” In Anaheim, CA! “The Chance Theater” At “The Bette Aitken Theater Arts Center” Presents “She Loves Me” December 5-28 2014, 5522 La Palma Avenue, Anaheim CA. “Will wonders never cease? 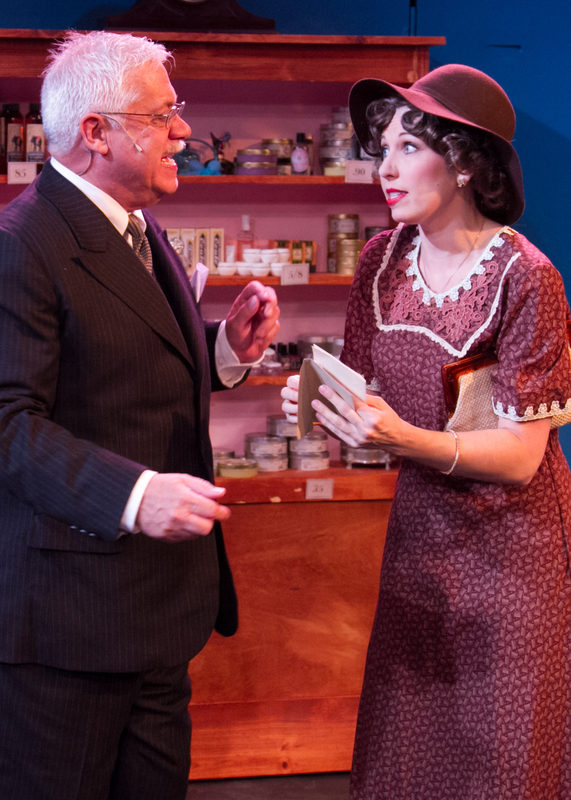 !” Just in time for the holidays, “The Chance Theater” at “The Bette Aitken Theater Arts Center” in Anaheim California, is presenting “She Loves Me”! 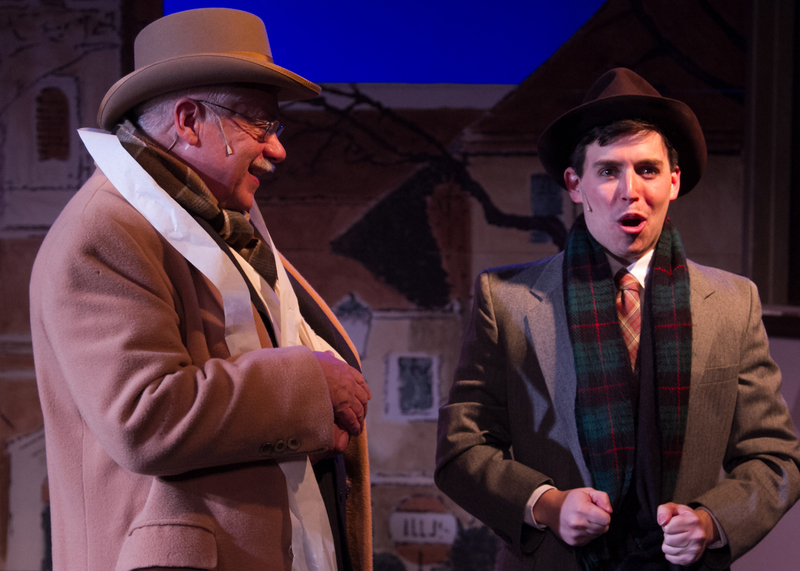 Charming, romantic—the perfect show to celebrate the season with, it features music by Jerry Bock and lyrics by Sheldon Harnick–the same team who created the unforgettable “Fiddler On The Roof”, with a book by Joe Masteroff (himself known for his work on “Cabaret”.) 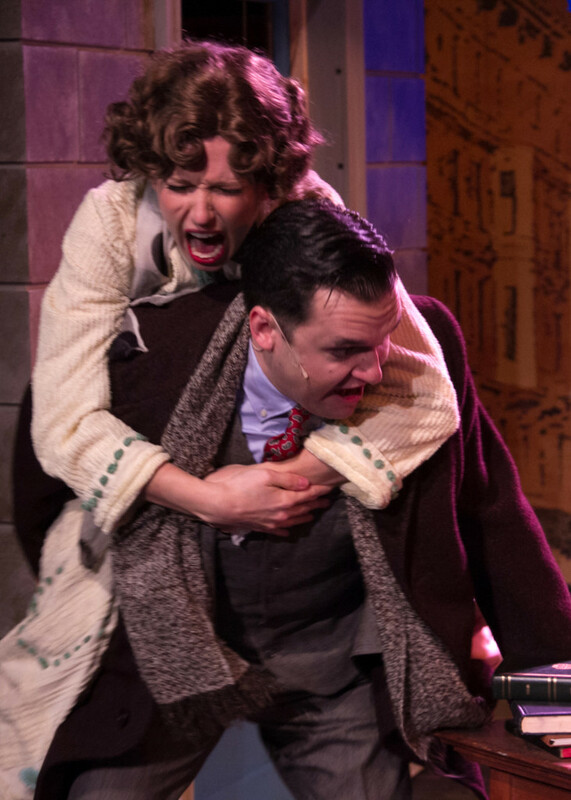 Often called a “jewel from Broadway’s Golden Age”, “The Chance’s” inspired revival provides audiences with a sweet little yuletide tale that makes a delightful Valentine to this festive time of year! 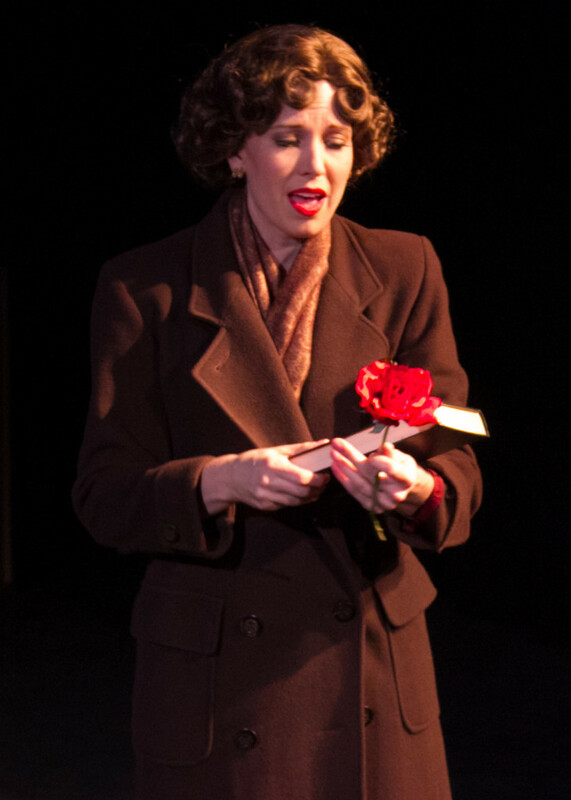 Adapted from the original play “Parfumerie” by Playwright Miklos Laszlo, “She Loves Me” stays pretty close to its source material that gave rise to such classic films as “The Shop Around The Corner”, “In The Good Old Summertime”, and more recently, “You’ve Got Mail”. Sarah Figoten Wilson’s insightful direction plays to the many strengths contained in Masteroff’s swift-moving libretto while emphasizing the honesty and veracity of the situations depicted–and, most especially, those depicting them. The engaging result is genuine, believable ‘people’ as opposed to your standard “Musical Theater Characterizations” so common in previous versions of the show. Then too, where it does appear, Christopher M. Albrecht’s nimble choreography is sharp and energetic—injecting a bit of animation and liveliness into the story while incorporating some sprightly Hungarian folk dance-moves to boot! (Indeed, sharp-eyed viewers may also notice how Albrecht has deftly thrown in a few ‘knowing nods’ to the Author and Song-writing team’s other, previously mentioned classics in several numbers.) There’s even a “Gypsy Violinist/Flower-girl” who pops in and out of the action, serving as a kind of tuneful ‘spirit’ of the city. A popular figure at “The Chance”, Camryn Zelinger once again proves her magnificent chameleon-like qualities as the lovelorn “Ilona”—so utterly and enchantingly ‘becoming’ the character that she’s nearly unrecognizable from her previous projects. “Ilona”, it turns out, has been having a not-so-clandestine ‘involvement’ with her co-worker, ladies-man “Steven Kodaly”. Taylor Stephenson’s “Kodaly” is more about laid-back charm than out-and-out ‘sleaze” here–if anything, he’s your typical “driven’ guy looking out for himself first, rather than about any (outward) malice. Stephenson’s handling of “Come With Me, Ilona” is deliciously seductive revealing his striking voice that really could make a girl melt! In fact, this one too, is definite ‘standout’ number in an evening full of them! (Of course, as is often the case, before the final curtain is rung we’ll learn that Kodaly is an even bigger rat than his laconic, easy-going facade would have us believe–one who “works hard—at all the wrong things!”) As the spat-wearing, puckish “Mr. Maraczek”, Beach Vickers is also thoroughly likable (but still capable of ample boisterousness and swagger.) 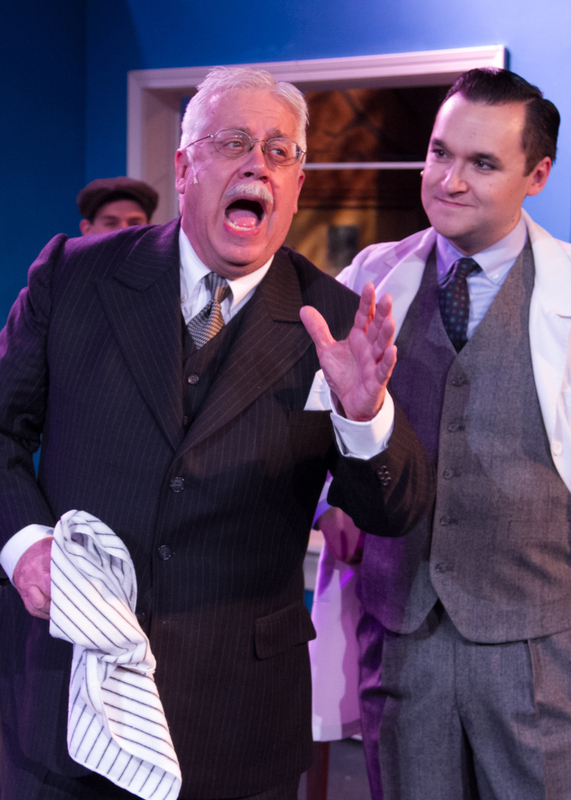 His energetic “Days Gone By” is an avuncular bright-spot early on, then a little poignant in its later reprise; meanwhile, Daniel Jared Hersh is likewise a ‘force’ as young go-getter “Arpad Lazlo”—initially the shop’s delivery boy who is ultimately promoted to shop assistant. He single-handedly re-charges the goings-on with his amusing Act Two opener, “Try Me”. Moreover, Corky Loupe’s take on the long-suffering clerk, “Ladislav Sipos” isn’t so much sycophantic or mousey (as it would be so easy to portray him as.) Instead, he’s more practical than pathetic. In addition, excellent supporting contributions are made by Matt Takahashi, who poses equal parts pretension, bluster, and hilarity as “The Café Imperiale’s” slightly jittery-but-still-overbearing “Maître d’ ”. His gifted ‘management’ of “A Romantic Atmosphere”—the one really big production number and also the funniest–makes this into a major hit; while Elizabeth Adabale also does an A-Plus job as a Billie-Holiday-esque “Blues Singer” in the same Café whose song-stylings and snippets of authentic “30’s era” standards help the transition from the shop to the restaurant (–one of the longer sequences, and one of the very few scenes to take places out of “Maraczek’s”) to come off as clever and seamless. Not to be overlooked either is Tina Nguyen’s “Gypsy Violist”; one of only two musicians the piece utilizes (the other being the dynamic work of pianist Ryan O’Connell who appears on stage throughout) she may not speak, but still makes her vibrant presence known in the very best possible ways nonetheless! As an ensemble, the entire bunch achieve some stunning collective work, such as in the opening, “Good Morning, Good Day”–a jaunty introduction to all the key players (and those they serve.) They also demonstrate terrific harmony during “Sounds While Selling” (which humorously exhibits the day-to-day undertakings of the shop.) Toward the end, the “Twelve Days To Christmas” is yet another energetic group effort that helps send the show out on a very positive, (if a touch, frenetic) note. 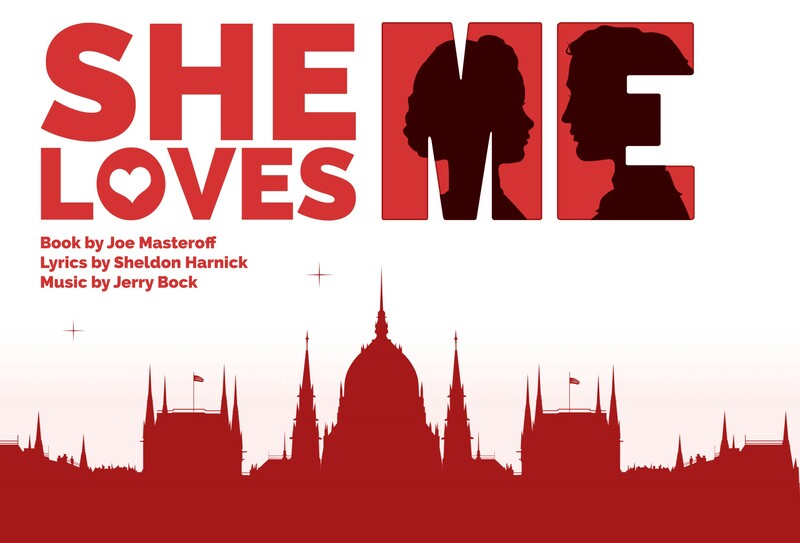 The simple orchestrations for “She Loves Me” both delicately–and brilliantly–recall the best of the old Hungarian school of musical composition (think Franz Liszt or Bela Bartok) with lots of dramatic embellishment and violin underscoring (–thanks again to the impressive work by Ms. Nguyen!) What’s more, Scenic Designer Bruce Goodrich demonstrates his own brand of ingenuity with a keen “fold away’ set that literally opens and closes as the store’s ‘hours’ dictate—and he’s done just as noteworthy a job as the show’s Costumer as well, furnishing smart, urbane, period garb that’s also right on the money. So why not present yourself with this big, bright, “musical candy-box” of a show? 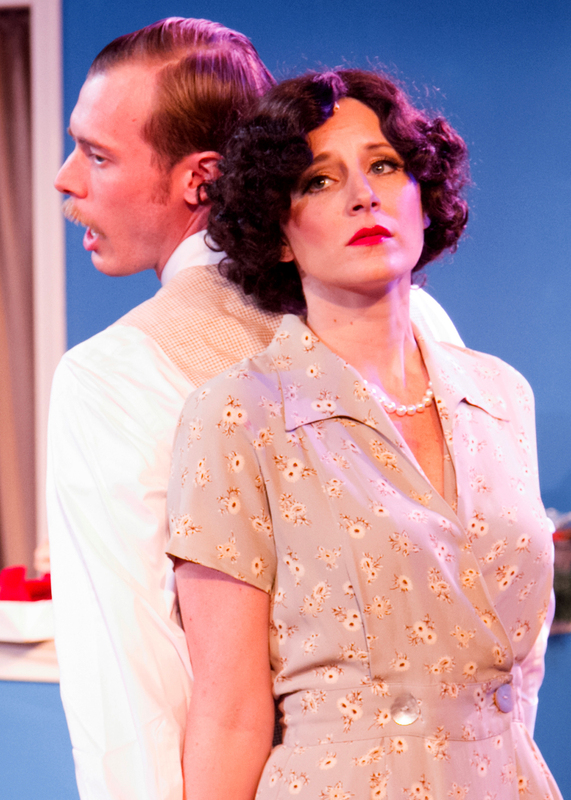 Having opened Friday December 5th, “She Loves Me” will play through Sunday, December 28th, 2014. Show-times are Friday and Saturday evenings at 8:00 PM, Saturday Matinees at 3:00 PM and Sunday Matinees at 2:00 PM ; “The Chance Theater” at “The Bette Aitken Theater Arts Center” is located at 5522 E. La Palma Ave., Anaheim, CA., and tickets for all performances can be obtained by calling (714) 777-3033 or logging onto: www.ChanceTheater.com . Production Stills By Doug Catiller At “True Image Studio” (www.trueimagestudio.com) Courtesy Of “The Chance Theater”; Special Thanks To Casey Long, Sarah Figoten Wilson, And To The Cast & Crew Of “The Chance Theater’s” “She Loves Me” For Making This Story Possible. 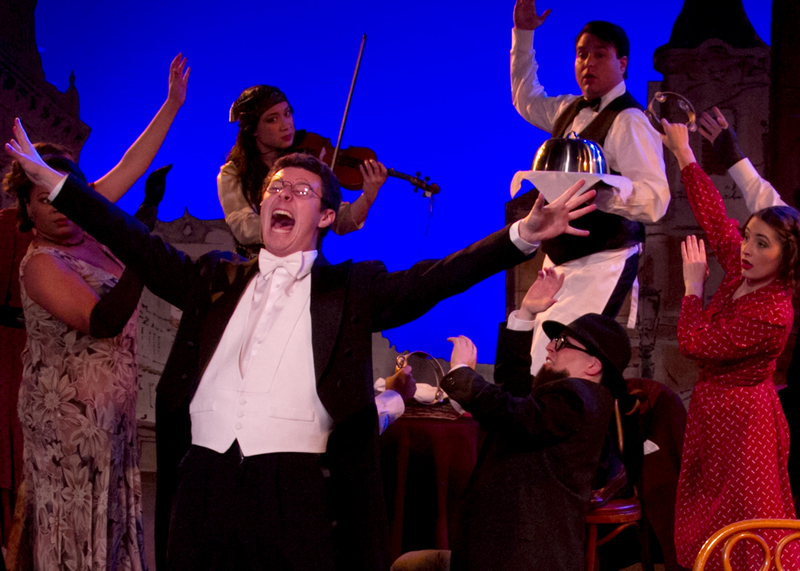 This entry was posted in Theater reviews and tagged "Pafumerie", "She Loves Me", "Shop Around The Corner", "Vanilla Ice Cream", 2014 Southern California Theater Season, Anaheim CA, Anaheim California Theater, Christopher M. Albrecht, Classic Musicals, Golden Age Musicals, Holiday Musicals, Jerry Bock, Joe Masteroff, Maraczek's, Miklos Laszlo, Sarah Figoten Wilson, Sheldon Harnick, Southern California Theaters, The Chance Theater. Bookmark the permalink.